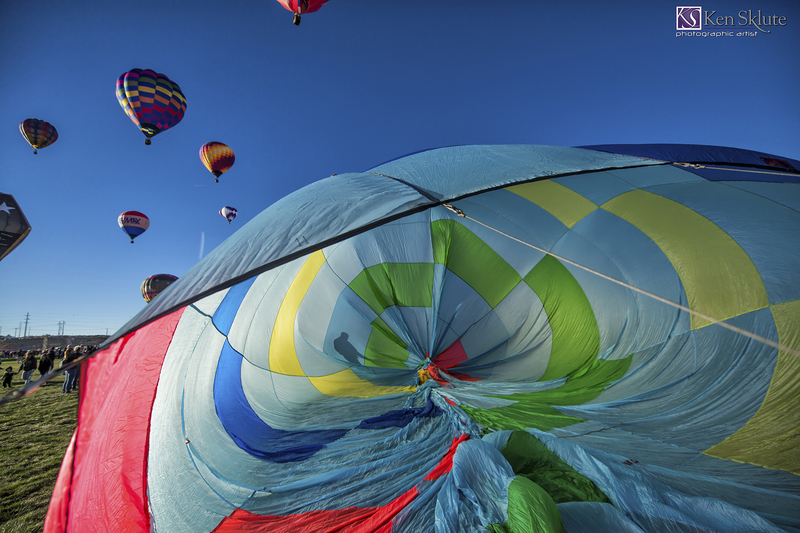 Welcome to the colorful world of Hot Air Ballooning! This article was originally published on August 14, 2015 and has been updated to include current product information. In this article series, I am going to share my thoughts with you on how to capture some pretty awesome photographs of hot air balloons. Each image will be captioned with my settings so you can see what has worked for me. I hope that you will find this helpful in providing you with ideas and the technical information necessary for you to create successful images of your own. But let me start with a fair warning – especially to those of you who, like me, are not early birds -- this is generally an early, early morning sport. Get over it. What you can see and capture once you wake up, whatever the hour, makes it all worth it. If this is your first time at a balloon event, you are in for a treat. 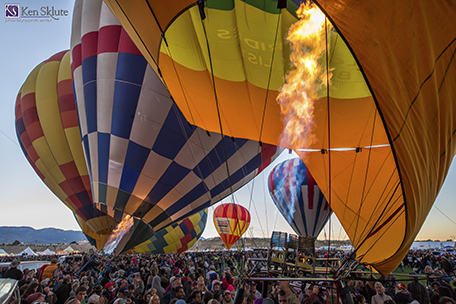 If this is your first Albuquerque International Balloon Fiesta, (AIBF) you will be in balloon heaven. Nearly 900 "balunatics" come to Albuquerque, NM to fly the drainage of the Sandia Mountains, which create a phenomenon called the “Albuquerque box." When active, the box effect allows a pilot to take off from the field and fly south. Then as the pilot takes the balloon higher, the winds change 180 degrees and the balloon is now heading north, allowing the pilot to navigate right back to the launch field and effectively land where he took off from, if the pilot chooses to do so. The box effect is not always active, but keep a watchful eye out for it, as it is something unique to the Albuquerque event. Please be sure to avoid stepping on the balloon fabric, watch out for the tie-off lines that anchor the balloons to the ground during inflation and the inflator fans that are filling the envelopes with cold air. You would not want to damage the balloons or get hurt in the process of photographing this beautiful spectacle. The field will be crowded with thousands of people at this point, walking amongst the colorful giants. I try and avoid having people in my images, instead just concentrating on my compositions of fabric, shape and light. For example, I look to use some of the balloon fabric in the foreground while capturing the balloons that may inflate first. I may also peek inside of an inflating envelope to see the backlit, colorful fabric coming to life as the sun should now be above the horizon. You can combine the inside of one balloon with others that may have already taken to the sky. As more of the balloons stand up, I will reach for my longer lens to compress the scene and eliminate other balloons, as well as the people. You will get a sense of what the winds are doing bright and early on Saturday morning as the "Dawn Patrol" takes to the still-dark skies. 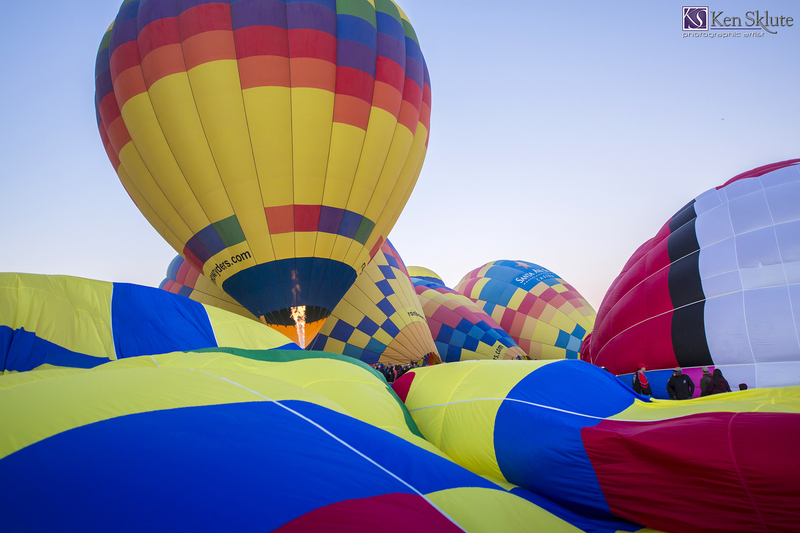 The Dawn Patrol is an early morning glow and launch of balloons. In capturing images of the Dawn Patrol, you will need to be working with a rather high ISO because these early risers inflate in the dark. I wait until the pilots stand up their balloons and glow for a moment before they go aloft. I set my ISO to 12,800 in order to be certain to come back with sharp images. The balloons will be moving once they are in the air, so your selection of shutter speed becomes rather important. You will want to use a shutter speed of 1/60 sec. or faster and select an aperture of f/2.8 or the widest setting to allow the greatest amount of light into the camera. The image above was captured at those settings that I just shared with you. You will want to have a monopod or a tripod for these images to provide stabilization for the sharpest images. Once the Dawn Patrol leaves the area, it is time to get ready for the Mass Ascension. At this point, I generally lower my ISO setting to 1600. As the sun rises and there is more light available, I will continue to lower my ISO settings until I am down in the ISO 100 range. You may want to take advantage of using the "Auto ISO" setting so you can give all of your attention to your compositions. The eastern sky will be coming to life, and the sun will rise over the horizon. I generally have two camera bodies on my shoulders, a full-frame body like an EOS 5D series camera (with a wide-angle lens, like a 16-35mm f/2.8), and a high-performance camera like an EOS-1D X series camera (usually with either a 70-200mm f/2.8 or the EF 28-300mm L IS lens attached). The goal with this mix of lenses and focal lengths is to be ready to capture images both near and far. There are so many things happening all around the inflation field that it will be difficult to decide where to begin. The larger "ride" balloons will be the first to inflate and fly, with their many passengers. I often begin with those as they stand up and add heat to their envelopes. Try looking to the east to use the colorful sky as a background for the pilots adding those huge flames to bring their envelopes into the sky. As the field quickly fills with inflated balloons, this is your time to try and frame the balloons in the air with the balloons still inflating on the ground. You may want to look out among the balloons in the air to see if you can isolate just one amongst all of the other balloons near it, using the sunlight to add dimension to your photo. As the morning’s inflation comes to an end, I study balloons in the sky to find shapes in the arrangement as the envelopes rise and descend. Even though the aeronauts are moving slowly, compositions are fleeting. Work quickly but carefully as you design magnificent compositions of the sky filled with color. After a fun day and with tons of images captured, I’d like to share a thought with you: one of the best ways I grow personally is by making a point of downloading and reviewing my images each and every day so I can assess what I have captured. I see what I like and what I might want to improve upon the following morning. I feel that if I review the images that I already have, then I can see what is working or what else I can create in order to complement my growing library of images. 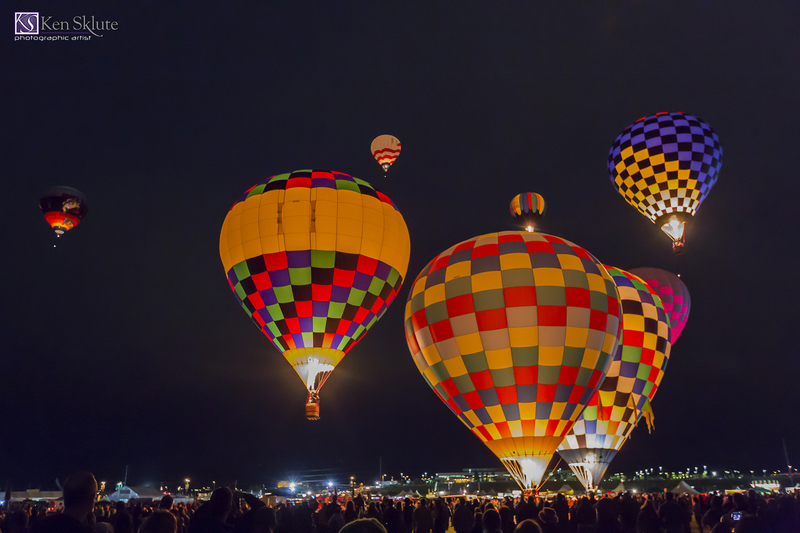 Check out the article on Balloon Glow, for tips on how to capture the best images as day turns into night. What a pretty time to be taking photos! 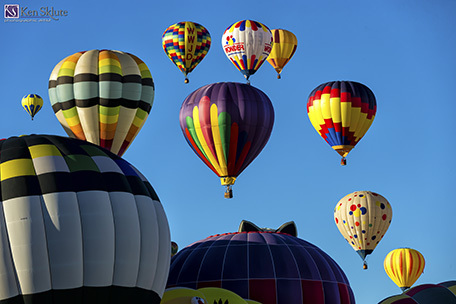 To see more articles on the Albuquerque International Balloon Fiesta, click here.